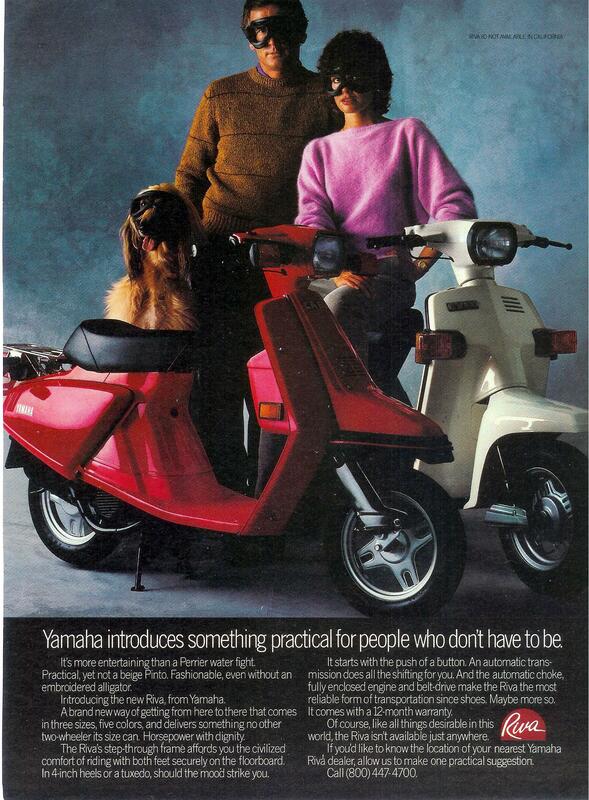 In 1982, Yamaha treated Canadians to the first modern 50cc scooter offered in North America, the CA50. In Canada, the CA50 was badged as the ‘Salient’, while American’s models got the name ‘Riva 50’ when it was introduced state-side for the 1983 model year. 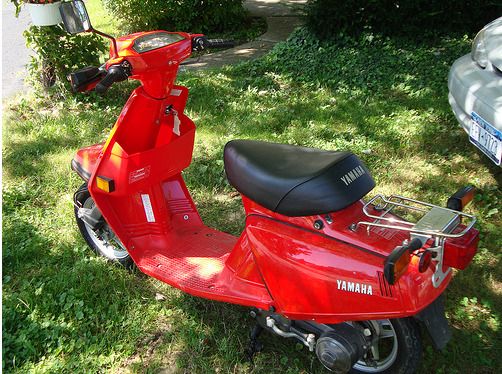 This scooter was introduced alongside the 80cc Yamaha Beluga in Canada (aka Riva 80 in the USA) with seemingly good sales success. The CA50 was an obvious competitor to Honda’s Aero 50 (which was also introduced for 1983 in the USA & Canada). The CA50 was sold until 1986, at which point it was replaced by the Razz (SH50) and Jog (CE50). Yamaha designates their vehicles with a letter corresponding to a model year. Yamaha used the letters K, L, N, S to represent the years from 1983 to 1986. If you are unsure which year is your CA50, have a look for the CA50 model code and it should be followed by one of these letters. Yamaha specs the CA50 at 100mpg, but real world milage for the Riva 50 / Salient is more like 60mpg. This fuel economy is okay but not great for a 2-stroke scooter of this size. Modern 2-strokes can do a bit better (ie. 75mpg) and 4-stroke 50’s can nearly double the Riva 50’s 60 mpg. The CA50 was quite a stylish scooter for its time. It was certainly more modern looking than Yamaha’s larger Riva 80, which wasn’t as clean of a break from the traditional (Vespa) scooter styling. The nicest part of the CA50’s styling is the rear haunches, which have great lines to them. One thing the CA50 lacked was enclosed storage. Yamaha equipped the Salient / Riva 50 with a ‘gear slot’ rather than a proper glovebox. This gear slot was larger than the useless gear slot Yamaha gave the Beluga / Riva 80 but it still didn’t serve much of a purpose. You could ram a burger or a small purse in this spot but the lack of security and protection from the elements meant that you couldn’t store anything long term like a spare pair of gloves. You can judge the usefulness of this gear slot yourself in the photo above. The CA50 does also have a rear rack which you could put to some use. A few other noteworthy attributes include a remarkably low dry weight of 121 lbs. Most 50cc scooters are in the 160 - 200lbs range with the steel bodied Vespa’s being at the high end of that. Also, the CA50 has a nice low seat height of just 28 inches. That combined with the light weight of this scooter means it should be a good scooter for smaller riders. The CA50 compares rather well to other scooters of its era, primarily Honda’s Aero 50. Other than the lack of storage (which the Aero 50 has in abundance) the Riva 50 compares closely. Both scooters have automatic oil injection, automatic choke, CVT transmissions, great reliability and top speeds around 35mph. If the storage difference isn’t an issue for you, base your choice on styling, condition and price. Compared to more recent 50’s, the Riva 50 does a little worse at the fuel pump and its going to be less reliable considering examples are about 30 years old now. The best ones to buy are the ones that have been driven regularly but still have low miles. Both high milage machines (ie. +10,000 miles) and machines that have sat for long periods (ie. 5+ years) can require some attention. Generally once you get them working well then they’ll continue to perform reliably. Parts are still fairly easy to come by, both on eBay and from Yamaha. CA50 Service Manual - Very helpful for anyone who works on their own scooter. Riva 50/80 Brochure Scan - Very nice stuff....classic 80’s.